Jet Fresh Flower Growers, S.A. has fresh-cut pink Ecuadorian roses for Valentine’s Day. Our roses are grown in Cotopaxi, 2,896 meters above sea level, and are available in many various shades of pink including unique bi-colors for all your floral needs this holiday. Roses from Jet Fresh Flower Growers are available farm-direct in the U.S. and internationally, as well as from Jet Fresh Flower Distributors in Miami. Vday Mix Roses from Jet Fresh Flower Growers, S.A. feature a great assortment of pink rose varieties available from our farm. Vday Mix Roses include 5 bunches of 25 stems with various color assortments including Hot Pink, Pink, Lavender, Bi-Color Pink, and either Yellow or Cream. Our Pink Mix includes an even greater amount of pink roses from our farm. This mix includes a single bunch of Hot Pink, Pink and Light Pink, as well as two bunches of Bi-Color Pink Roses. 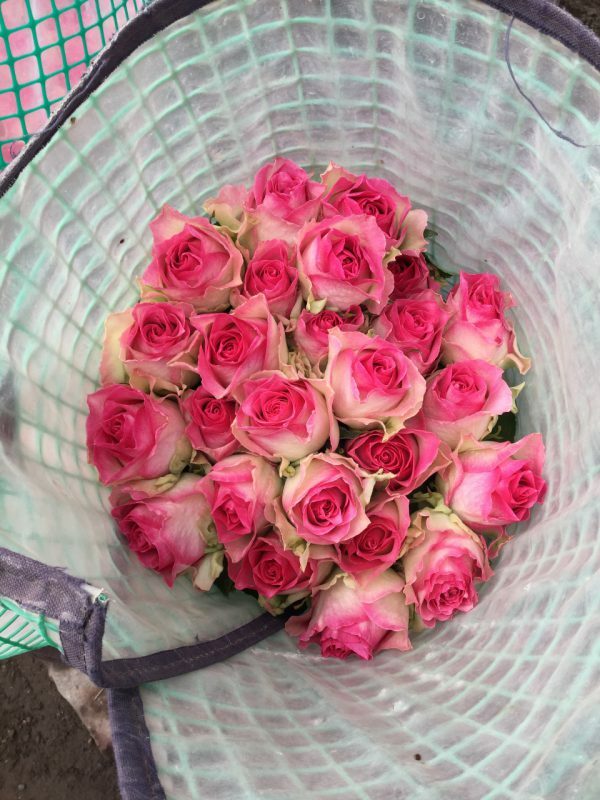 Let’s take a closer look at the pink Ecuadorian Roses available from our farm. “Cherry Oh” is the ultimate pink rose for Valentine’s Day because of it has bright reddish tones giving you the best of both colors. This hot pink rose variety is a year-round performer with rose heads that measure 7-7.2 cm long. Join Mike, in this episode of JFTV as he takes us into a sea of “Cherry Oh” straight from the greenhouse of our farm, Jet Fresh Flower Growers. This beautiful dark-hot pink (almost red) rose, is a must-have Valentine’s Day! “Topaz” is another beautiful hot pink rose available from our farm for Valentine’s Day. This variety has precious, gem-like qualities with vibrant petals that stand out when they bloom. The outer petals are lighter which contrast nicely as these petals open. “Topaz” has a nice head size that measures approximately 6.8 – 7cm in length. “Ballet” roses from Jet Fresh Flower Growers, S.A. is a strong pink rose variety with elegantly ruffled petals. This variety opens beautifully forming a round bloom with a medium bud size measuring 5.8 – 6cm long. “Sweet Unique” is another great rose option for Valentine’s Day. This sweet variety has a yummy shade of pink that softly lightens as it blooms “Sweet Unique” has a head size that measures 5.8 – 6cm long. “Faith” is another beautiful pink rose variety available for Valentine’s Day. This variety has a unique shade, unlike our other pink roses from our farm. “Faith” is a dusty mauve pink rose that are classy and elegant for weddings and events with a head size that measures 6.2 – 6.5cm in length. In this episode of JFTV, Jason features our favorite mauve-pink rose, “Faith.” As George Michael used to say, “You gotta have it!” This variety forms a large bloom when hydrated, and looks great doing it. Rosita Vendela is a light pink rose and a wonderful option for Valentine’s Day. This lovely rose variety has a deep shade pink with creamy white edges. Rosita Vendela has a head size that measures approximately 6 – 6.2cm in length. “Titanic” is another light pink variety available from our farm, Jet Fresh Flower Growers, S.A., for Valentine’s Day. This light pink rose reveals soft pink pastel petals with a head size that measures 7 – 7.2cm long. Jet Fresh Flower Growers, S.A. has various bi-color pink roses for Valentine’s Day. These unique roses have many unique shades of pink expanding your Ecuadorian rose selection for Valentine’s Day. “Sweetness” is one of our vibrant bi-color pink roses with hot pink edges and outer petals that stand out in any arrangement. “Esperance” is one of those bi-color rose varieties whose beauty must be appreciated when it opens. “Esperance” is a cabbage-like rose that forms a large bloom with creamy petals and pink edges for this elegant variety. These roses have a head size that measures 7 – 7.2cm long. Have you taken a test-drive of our “Carrousel” bi-color roses, yet? This variety is another great option for Valentine’s Day from our farm in Ecuador. “Carrousel” has a white petals with a gorgeous hot pink – fuchsia trim that is absolutely stunning as it blooms with a head size measuring 6 – 6.5cm long. Barbie would definitely approve of these Ecuadorian “Malibu” roses for Valentine’s Day. These vibrant pink bi-color roses are white along the bottom half and hot pink towards the edges of the petals. “Malibu” does a great job showing off her unique features with a head size that measures 6.5 – 6.8cm long. To order Valentine’s Day roses directly from our farm, Jet Fresh Flower Growers, S.A., please contact us at Growers@JetFreshFlowers.com. And for U.S. orders, please contact us at Sales@JetFreshFlowers.com. For more information on how to buy from the Jet, please visit How To Buy. This entry was posted in Jason Knows Flowers?? ?, Jet Fresh Flower Growers, News and tagged Ecuador, Farm, Jet Fresh Flower Growers, pink, Roses, Valentine's Day.